Guards Gone Wild | Go wild. Go write. To purchase the book, clickhere. Their situation is not helped by the powers that be thinking that the security industry can be improved byslapping individual guards with fines and jail time, thus perpetuating the idea that the problem lies in the individual. Emotions are running high after a video clip of a fisherman striking a crocodile to death surfaced on the internet. The fishermen involved in the incident have been critcised by social media users for exhibiting cruel behaviour towards an animal. Apparently, a saltwater crocodile had gotten entangled with a fishing net and a group of fishermen took it upon themselves to kill the animal. Social media users are lambasting the fishermen while suggesting that they could have gotten the relevant wildlife authorities to handle the crocodile in a more humane manner. However, in my opinion, the fishermen were facing two problems that prevented them from acting in a manner that would have pleased all animal lovers watching the scene from the safety of their bedrooms. First of all, I don’t think the fishermen actually had the time to hang around and wait for the wildlife authorities to arrive at the scene and release the crocodile back into the wild. If you actually watch the video clip, you will see that the net was rolled up like a string and it was just the crocodile’s snout that was entangled in it. Its whole body was free to struggle and trash about. I think it could have gotten free given some time and effort. Most importantly, the net wasn’t secured to any structure. It was just two men holding on to the net. The situation was not in the fishermen’s favour. The second problem the fishermen faced was that the saltwater crocodile has a strong tendency to treat humans as prey. It’s not a dog. They didn’t really have the option to just give it food to gain its trust and then stroke its scales to calm it down. You do that to a crocodile, a saltwater crocodile known for aggressive tendencies towards humans, you could lose more than just a hand. Also, when I watched the video, what I saw was one fisherman striking the crocodile on the head with a hammer. The fisherman actually aimed properly and took care to give the crocodile the least amount of suffering. I saw no element of torture. Last but not least, I think fishermen do have the duty to eliminate dangerous predators from within their fishing territories. For their own sake and for the sake of their communities. So, animal abuse or self-defense? * The above image was copied from this Yahoo! News article. Don’t get me wrong. I am a Jeet Kune Do practitioner myself and I truly believe that it is one of the most scientific fighting systems on Earth. It’s right up there with Krav Maga and Systema and all the other stuff that Special Force soldiers love. And I am a free speech advocate. I don’t even want vile books like Mein Kampf to get banned because I know if you start with Mein Kampf, it won’t end with Mein Kampf. And before you know it, we find ourselves living in a dystopian society where public libraries have to be protected by militia units. So why do I want to ban the Tao of Jeet Kune Do? Because reality has been a harsh teacher and, as it turns out, between the propagation of Bruce Lee’s quotes from the book and the advancement of his school of martial art, one must give way to the other. Wait, that’s not quite right. The Tao of Jeet Kune Do was written in the English language and English has been taught as the first language in Singaporean schools for decades. So what language barrier am I talking about? An English teacher of my acquaintance had this to say about our standard of English. Singaporeans are competent enough to read complex technical manuals written in the English language, but many of us tend to fall short when we try to read between the lines or grasp ethereal concepts. Well, it’s not surprising when you consider the fact that our government has been raising engineers rather than poets in our schools. And the thing to note about the Tao of Jeet Kune Do is that it’s not a technical manual. It’s stuffed full of abstract concepts. In the book, Bruce Lee talked about being formless and the Void and using no way as way and being like the reflection of the moon and all the esoteric stuff that would be right at home inside a philosophy textbook. The Singapore Word Slingers Are Recruiting! We are a mutual aid society for serious writers who want to get published. Ideally, you should already be working on your manuscript or have already completed your manuscript. If you are already working on your manuscript, then you should know the difficulties writers face when they need to do research for certain characters or professions. Suppose you need to write a scene where a security guard chances upon a crime in progress but you have absolutely no idea what security guards do at work? So what could you do to flesh out the character and the scene? You could go pavement pounding and hope to run into a friendly security guard who might be willing to answer your questions. Or, if you are in a mutual aid society for writers, you could pose your question to your fellow group members. One of them might be a security guard or somebody might know enough about security work to answer your questions. Or maybe you need to write a realistic fight scene for your protagonist. If you are not a martial artist yourself, you could go watch a Jackie Chan movie and prescribe flashy and unrealistic moves for your protagonist. Or, if you are in a mutual aid society for writers, you could interview fellow group members who do practice martial arts in real life. There you go. A Human Library. What’s the point of a marketing team? Well, if your manuscript has already been picked up by Penguin Random House, then you have nothing to worry about. But if you are considering self-publication, then you will have to worry about marketing. How are you going to get exposure without an established company backing you? Since this is a mutual aid society for writers, members will be obligated to lend each other a hand. If a fellow member is having his debut, then you can lend a hand. Write a review and share it on your blog. Tweet it on Twitter. Share links on Facebook. Gather friends for the book launch. And when it is your turn, the others will do the same for you. For this reason, members will be expected to regularly maintain their blogs and social media accounts. What is it that writers do? We observe Life and we write. So we will be holding regular themed meetings that will allow members to observe multiple facets of Life through each other’s experiences. What it means is that we will select a theme for the meeting and invite members to participate in the discussion. For example, a themed meeting like “Memorable Holiday Experiences” will allow members who have traveled overseas to share their holiday stories and members who haven’t (traveled overseas) can experience moments of life in countries they have never visited before. Because unless you are a technical writer, you will need a rich life experience from which you can draw ideas from. But at the same time, it is unrealistic to spend all that time and money to travel to Paris (if you haven’t already been there) just because you want to include one romantic Eiffel Tower scene in your romance novel. So you make do with what limited resources you have. For example, the Human Library in the mutual aid society. Membership is free! Being in this group means your fellow members won’t charge you a single cent for promoting your book or critiquing your manuscript. If you are interested, send me an email. My address is guardsgonewild@gmail.com. Oh yeah, one last thing. Because our meetings will take place in meatspace, we are currently only recruiting members who reside in or who can travel to Singapore. My Last Meal For The Year 2018! My last meal for the year 2018 consists of a large plate of Yin Yang Carrot Cake and a small bowl of Siew Mai. Why is it called Yin Yang Carrot Cake? Because I ordered 2 portions. One white and one dark. The dark version was flavoured with soy sauce. And then I separated them into 2 halves on my plate. It’s my hope for the year 2019. I am hoping for a harmonious new year. My Book Is Also Available At These Outlets! The Times Bookstore at Marina Square! Here, my book is shelved under self help. It’s not really wrong. You can say Guards Gone Wild! is self help for security guards! Kinokuniya at Liang Court in Singapore! At the Liang Court Kinokuniya outlet, my book is not shelved under any particular section. The store placed it on a display shelf near the entrance. The Times Bookstore at Jelita! In Singapore! At the Jelita outlet, Guards Gone Wild! is shelved under singapore interest. My Self-published Book Is Now Available At Chain Bookstores! That’s a big step forward for a self-published author. Most of the time, chain bookstores don’t deal with self-published works. So for my book to be accepted… It means a lot to me. And I would like to share this joy with all of you here. Right now, 2 chain bookstores in Singapore have started retailing Guards Gone Wild! at their retail stores. They are Books Kinokuniya and Times Bookstores. These photos were taken at the Takashimaya Kinokuniya outlet. Here, my book is shelved under CULTURE & TRADITION. At the Bugis Junction Kinokuniya outlet, Guards Gone Wild! is shelved under NON-FICTION. My book may not be available at all Kinokuniya outlets, so be sure to make a phone call before setting off on your book-shopping trip. These photos were taken at the Times outlet at The Centrepoint. Here, my book is shelved under asian interest. It’s right next to Lion City so it’s in good company. Not all Times outlets carry my book. It’s not available at their Plaza Singapura and Paragon outlets. 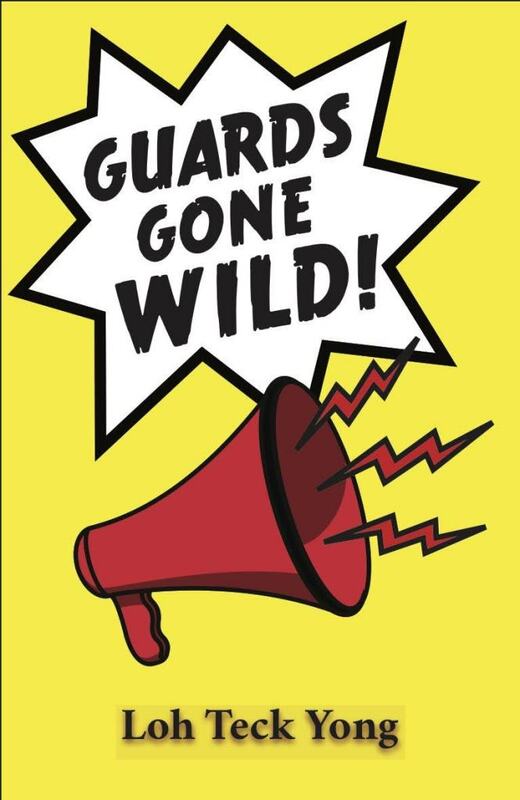 So anyway, as you go about your book-shopping trips this Christmas season, be sure to keep a lookout for Guards Gone Wild! at Kinokuniya and Times outlets!